APPEARANCE: Umi zatō are mysterious, gigantic yokai which look like blind guilds-men, or zatō, who wander the seas at night, tapping the waves with their long canes. INTERACTIONS: Very little is known about the mysterious umi zatō. They are usually considered to be harmless and leave people alone. 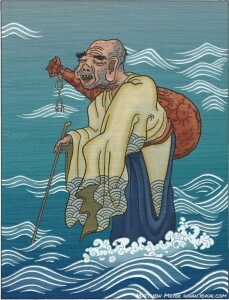 However, according to some tales, umi zatō harass fishermen out at sea. They are said to beckon ships towards them, and when the ships draw close, they flip them over and capsize them. They also occasionally swallow entire boats whole. They do have a congenial side, however. If the people on a ship reply to an umi zatō in a polite and docile manner, the umi zatō will vanish and leave them alone. ORIGIN: Because there are so few legends about the umi zatō, almost all of what we know about them is only speculation. 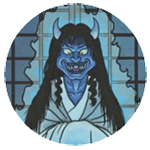 They are sometimes considered to be cousins of the similar-looking umi-bōzu, but it is very likely that umi zatō is an invented yokai thought up by Edo-period artists solely for decorating old picture scrolls.